Now a year-round, industry-wide initiative, the Two Ten Footwear Foundation’s Footwear Cares volunteering platform continues to gain momentum and substance. 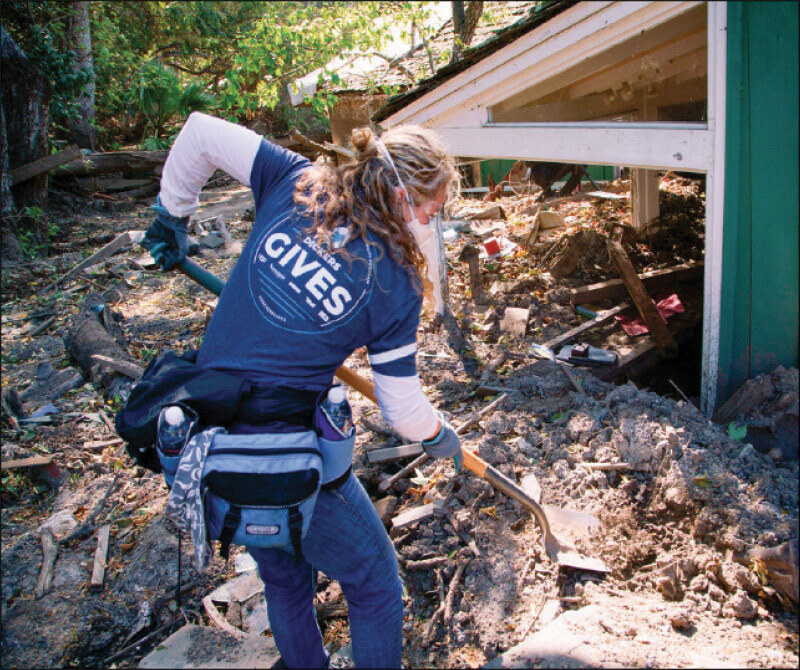 Dig it: Volunteers from Deckers Brands and REI helped California residents clean up after the recent mud slides. Have you heard? Volunteering is the new black. A growing number of people, especially younger ones, want to take part in community service programs. What’s more, these people want to work for—and buy from—companies with a conscience. Volunteering is even becoming the new golf outing, where employees come together across all levels to do charitable work in their local communities; at the same time, they network and build closer relationships with fellow employees and industry colleagues. It’s no wonder Footwear Cares, the industry-wide charitable platform launched by Two Ten Foundation six years ago, has seen participation soar in the number and range of events as well as the number of overall participants. Since the beginning of this April alone, footwear employee volunteers have dedicated more that 3,300 hours of their time to help non-profit organizations within their local communities, including food banks, homeless shelters, Ronald McDonald Houses, meal delivery services, AIDS walks, park cleanups, Habitat for Humanity builds and donation warehouses. The volunteerism has directly impacted more than 3,100 children and 3,250 families, provided 33,750 meals and sorted tens of thousands of pounds of food. According to the Independent Sector, with each volunteer spending on average three hours per shift and valued at $24.69 an hour, footwear employees contributed in excess of $81,000 worth of time to these charities during the month—all thanks to Footwear Cares. What began as a day of volunteering quickly moved to a month of events each April and now is a year-round program. Newman wants the industry to see Footwear Cares as a seamless facilitator to community service—a portal that offers instruction on how to get involved, how to sponsor an event and, most of all, how to volunteer. It’s easy. Just log onto twoten.org/get-involved/footwear-cares/ to learn all about Footwear Cares, and you’re a click or two away from a rewarding day of volunteering. 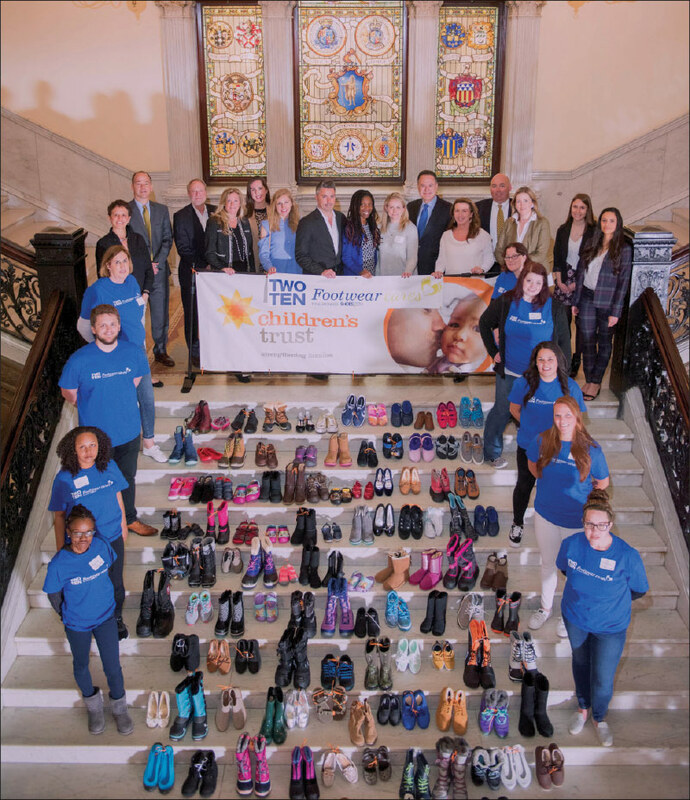 Employees of Shoes.com, title sponsor of Footwear Cares, on the steps of the Massachusetts State House, displaying its donation of 344 pairs to The Children’s Trust in support of victims of child abuse and neglect. Anyone can be a volunteer. Anyone! You don’t have to be athletic, a certain size or possess specific skills. Volunteering is gender neutral and ageless. There are no income level requirements. It can be done indoors or outside, on-site or off, in small groups or large, and pretty much whenever is convenient. The range of charitable organizations and the activities to partake in listed on the Footwear Cares site are as broad as are the needs. Soup kitchens, food banks, homeless shelters, Habit for Humanity sites, neighborhood green spaces, schools and in-office collection drives all serve as possibilities. Newman cites a recent Footwear Cares event involving employees of Deckers Brands and REI as an example of great networking. The volunteers helped clean public areas after the recent California mud slides, which was dirty, hard work. “The relationships made between Deckers and REI wouldn’t have happened otherwise,” he says, adding that it was two customers both helping their target customer. It was a win-win-win scenario. “All we heard was how overjoyed everyone was by spending a few hours to make life better for those residents,” he adds. 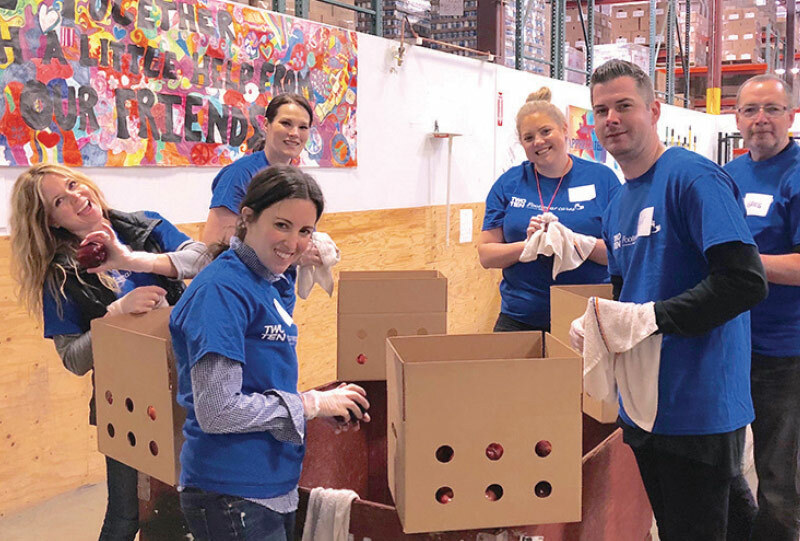 Joanne Tucker, operations manager for Topline, says the biggest takeaway from its annual Footwear Cares day at Northwest Harvest food bank was the opportunity for its 45 associates to work together in a different way than they do daily in the office. “It’s not just about socializing, they’re having fun and building teamwork for a good cause,” she says. However, Tucker notes the most rewarding part of this year’s effort didn’t involve a Topline employee. It was meeting a woman in her 70s who stops by the food bank every day to work a shift. “She wasn’t part of Footwear Cares or even the industry,” Tucker says. The women’s positive attitude in helping her community was inspiring. “We volunteer at the food bank once a year, but there are great people like her who volunteer on a regular basis,” she says. That doesn’t mean Topline’s team didn’t make a difference. With assembly-line precision, the team scooped, measured, packed and shipped thousands of pounds of rice during its shift. “We repackage it into family-size portions,” Tucker says. For those counting, it was 5,376 pounds of rice into 4,135 meals for Seattle-area families in need. Networking was also a highlight for NPD Group’s 14 volunteers who prepped meals at God’s Love We Deliver, a nonprofit dedicated to helping those living with serious illnesses in the New York metro area by alleviating hunger and malnutrition. Sarah Bloch, NPD’s executive director of footwear and accessories and a member of Two Ten’s newly established Associate Board, says the company’s second year participating in Footwear Cares was a joy from start to finish. Employees interacted with each other as well as vendor partners. “I know it’s hard to get out of the office sometimes, but Footwear Cares brought us a renewed sense of not only accomplishment but gratitude for each other and helping others,” she says, noting they were joined by employees of Kenneth Cole Productions. “They weren’t the people we usually interact with, so it was nice to partner with them in a different way,” she adds. Zappos employees volunteering at its annual “Operation Prom Closet” that donates dresses, shoes and accessories to more than 2,000 low-income students in the Las Vegas valley. Members of Chinese Laundry, UBM and Seychelles box food for donation at the L.A. Food Bank. There is no company too small and every little bit of volunteering counts to a greater good. There’s no reason not to get involved, only plentiful reasons to volunteer. Most importantly, it’s easy!